After the much-expected camera focused phones- the P20 and P20 Pro, Huawei is planning to roll out yet another smartphone under the Honor brand. 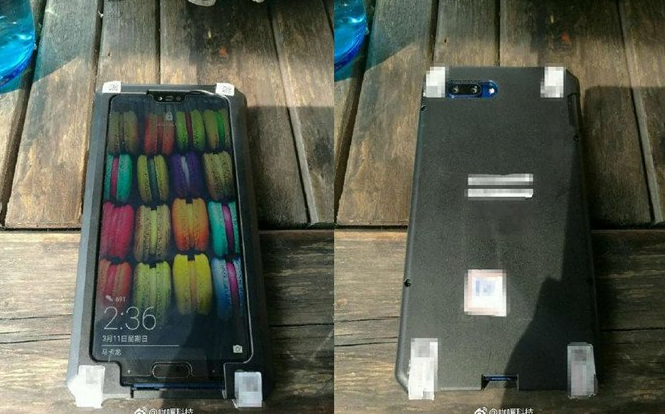 We get to know about this phone by the new leak which has surfaced on the internet. The smartphone being talked about here is the Honor 10, which supposedly is going to be the successor to the Honor 9 which came out last year. The interesting thing to take note of here is the fact that Honor 10, as shown in the leaks is likely to come with an iPhone X like notch on top, although the notch is going to be smaller than the one on the Apple iPhone X.
Huawei really seems to be in awe of the notch design as we see very similar notch inspired aesthetics on the Huawei P20 and P20 Pro. The Honor 10, like we said is going to take the Honor range forward with it stepping in the market. The leak which sports the Honor 10 in a packaging, shows the front and back of the phone where we can see clearly that this latest installment in the Honor phone series is going to be inspired by the notch design. Huawei has come up clear with its design strategy as they have implemented a similar design in the Huawei P20 and P20 Pro, it can be said that with Huawei devices coming in 2018 the brand will continue with the same design. As for the Honor 10, in the leak, we get to see that the fingerprint scanner has been placed in front, on the chin of the phone which will also function as the home button. Although there is no capacitive button present the phone is not going to be entirely bezel-less which might be a disappointing factor for some buyers in future, when the phone comes out. Speaking of the rear of the Honor 10, the phone definitely comes with a dual camera setup which has been placed horizontally on the phone. Also, the LED flash has been placed right beside the dual cameras. The presence of the LED flash also denotes that the users will be able to snap photos with ease even in low light settings. Also, a flash has been provided on the front side too along with the selfie camera, which is also present on the top notch on the front side. There is, however, no news about the launch of the Honor 10. Although Huawei definitely has started teasing the audience with the hints of P20 and P20 Pro on their website. If we take into account last year’s data, given that the Honor 9 was launched in June of 2017, it’s expected that the company might have plans to launch the Honor 10 in June this year too. It will be exciting to see what improvements Honor brings over the 9th iteration of their phone, and also if this new hybrid design fares well in the market or not.